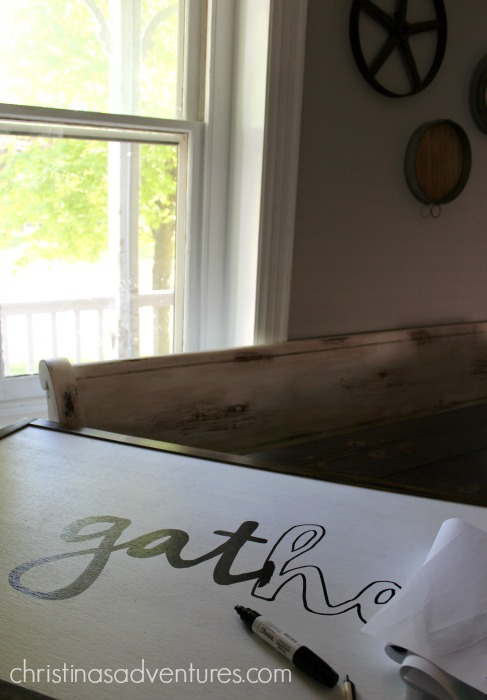 Making a show-stopping DIY large wood sign is easier to make than you think! 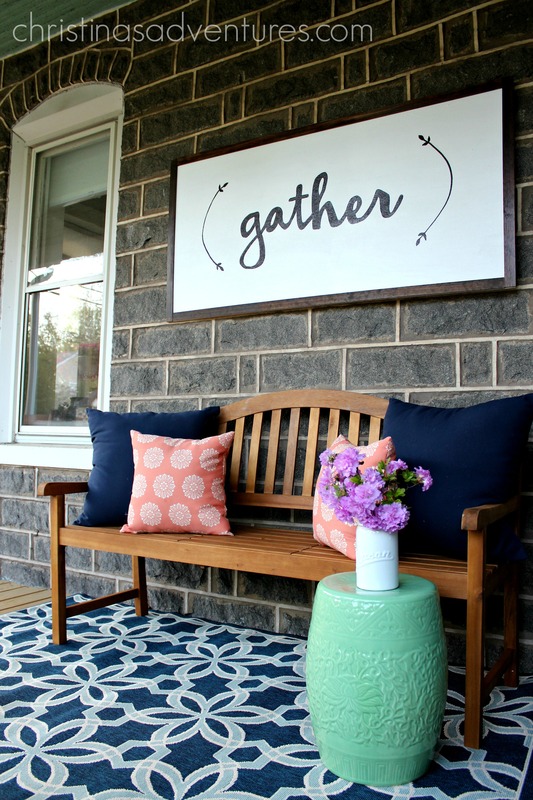 Here’s a great tutorial for how you can make your own gather sign for your home. 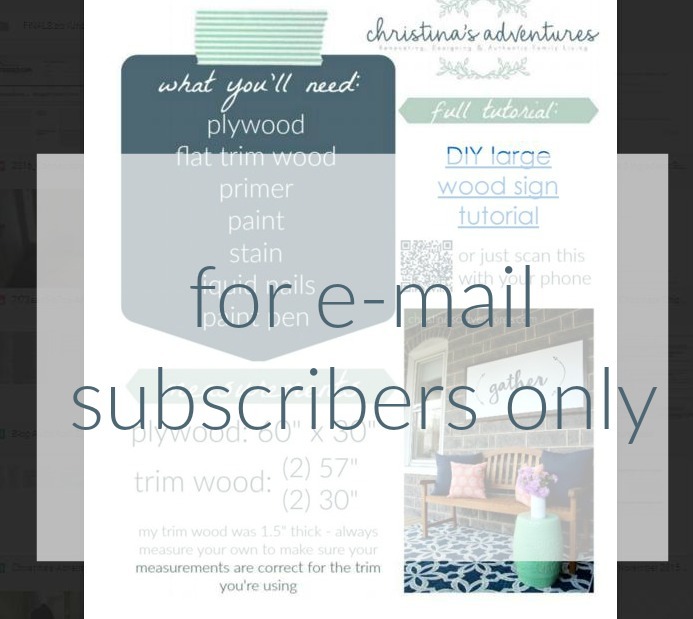 subscribe to my e-mail list at the bottom of this post to receive this printable wooden sign template for FREE! I made a video of the process here – to see the pictures and instructions, keep scrolling down! The back of this sign is made of plywood. I got mine cut at Lowe’s once I figured out the correct dimensions. Make sure that if you’re going to be using this sign outdoors (like I did) that you get an exterior plywood. 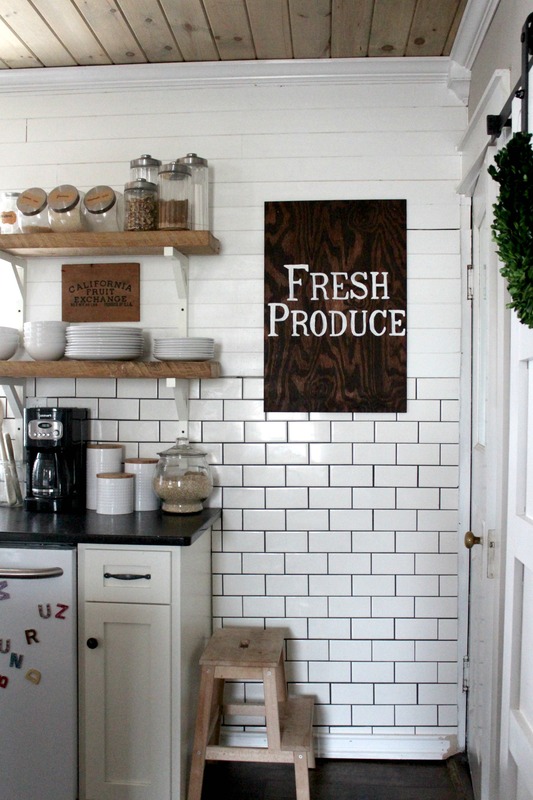 Paint the plywood your color of choice – I did a coat of primer & a coat of satin white paint. Then you’ll make the “frame”. It’s so simple – I stained flat trim wood (it’s $5 for an 8 ft. piece) and adhered it with liquid nails. Once you’ve traced your word, you’ll want to fill it in. 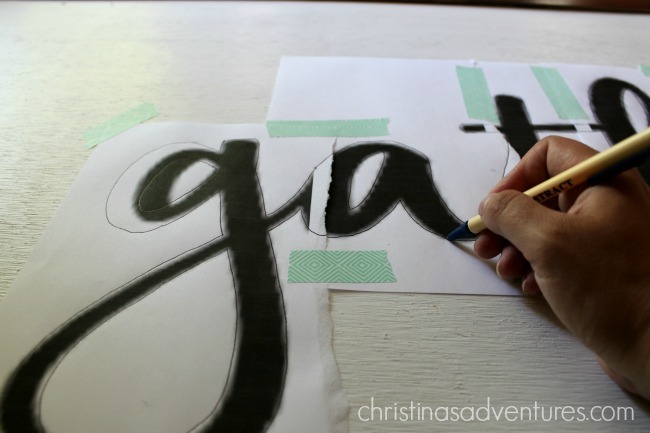 You could choose to use paint and a small brush, but it makes it SO much easier if you use a paint pen. 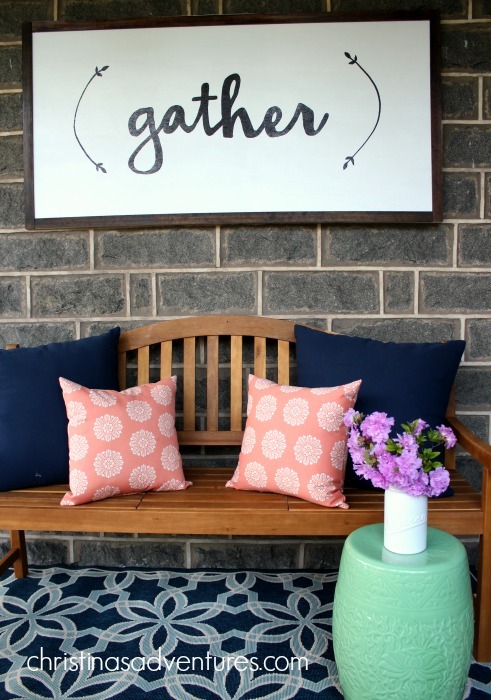 See more pictures of our welcoming porch space here. Like this large wood sign tutorial? Share with other and save for later by pinning on Pinterest here! So cute! My SIL and BIL are moving into their first home soon and this would make an awesome house-warming present. Do you mind sharing the name of the font you used? Thanks so much, Abby! That would be such a sweet gift 🙂 I’m so sorry – I don’t remember the font name 🙁 I got it from http://www.dafont.com/ though – they have so many good free fonts! 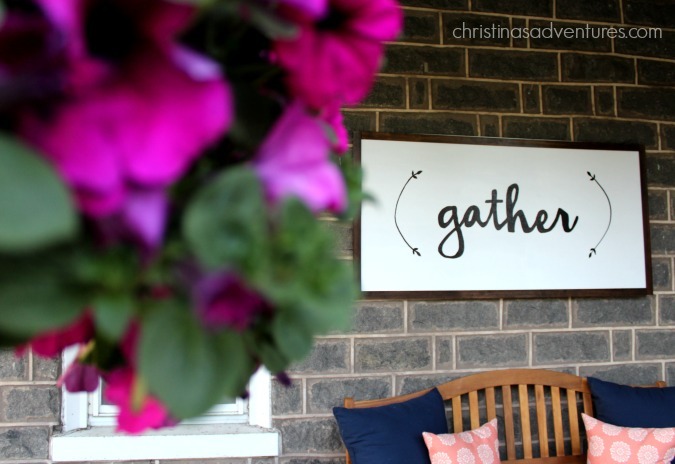 would love to know the name of the “gather” font!!! I always wondered how people make these signs with such perfect writing! I am so tempted to make one now! Do you have dimensions of the cut plywood and trim pieces? I always thought I would never be able to make a sign like yours but you make it sound easy! I’m going to give it a try! Thanks! This is my kind of DIY! I can’t wait to make one for the porch!! Thank you so much for the “how to” especially the tip about using the paint pen! Where did you find the flourishes for the beginning and end of the sign? It is gorgeous!! The word program on my Apple computer does not enlarge the letters enough. Any suggestions? I just subscribed for your emails. can you send me the printable for this sign….please? Just came across this tutorial and it is EXACTLY what I’ve been wanting to create for my family room. Has a printable been created for this sign? If so, I’d love to find out how to obtain it 🙂 Thank you! Nice site – glad I happened on to it. My brother and s-i-l just rebuilt a cottage on a lake on property that has been in her family for several generations. The previous cottages were all named the same so I’d like to gift them with a sign with the same name to put over their front door. This sign would be out in the weather. Do you have any suggestions of recommendations as to weatherproof this? Thanks. I love this! Unfortunately I haven’t been able to get the video to load. Can you explain a little more about how you adhered the frame? Did you adhere to the front of the plywood or the side? Thanks so much! I’m anxious to try it!! How did you do the frame around it? I’ve made my sign, and now I’d love to know how you did your simple frame? thanks! I appreciate this tutorial! Did you use a water or oil based paint pen? How do you hang a heavy sign likūe that? I know the plywood is an exterior plywood, but was it a specific kind? The sign is beautiful! Love this sign and I would love to have the template. Thanks! I just painted our dining room table with white chalk paint and the chairs are black and I distressed them all. This will go perfectly in that room. I just need to know how thick was your plywood? Thanks! Wonderful sign & tutorial. Can’t wait to fix one for our back porch! Love this project!! Thanks so much for sharing!!! Hi! Did you use the oil based sharpie paint marker? I’m going to pick up a pack of them, but they also offer water-based, so just double checking! Hi There, I love your gather sign. I’m going to try to replicate this beauty! Love this! Subscribing now, would love to receive the link. Love this tutorial and can’t wait to start getting your emails. Thank you for the tutorial and for sharing the template. This will not only save time & money, it will add the perfect touch to my dining room. Thanks for the idea and tutorial. I upcycled an old cabinet door that was in our Catholic Church’s original parish hall. For some reason my Dad had saved it over 30 years ago when the hall was torn down to build a new one. The door was in his barn and I spotted it last weekend and knew it would be perfect for the project. I cleaned off the dirt and painted chalkboard paint on the center of the door and used a chalk paint pen to write with. It will be the perfect addition to our kitchen décor just in time for Thanksgiving! Genius! I just made a sign using this tutorial and it worked fantastic! Thanks so much! Thanks! I would love to make he gather sign. Sign me up for emails. 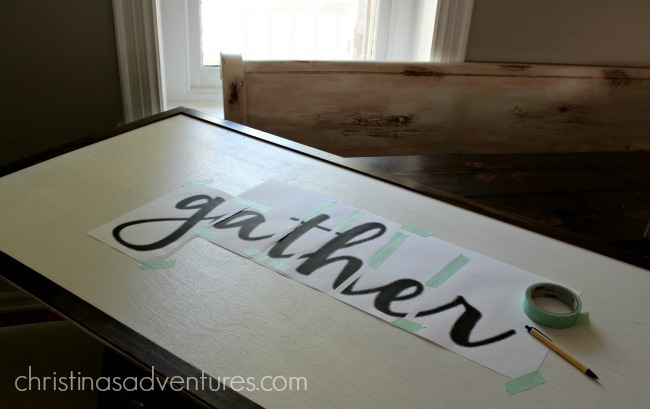 What font did you use for your gather sign? Did you only use Word or another program for the font? This is gorgeous! Wondering if you purchased a specific type of plywood? Probably a silly question but did you paint the back as well? 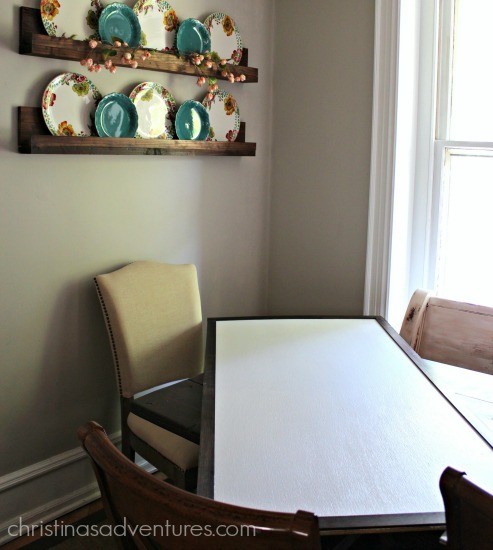 I’m going to try this for our diningroom.Thanks! I love this sign!!!! I would love to have the template! Thanks! What did you do to finish the edges, if anything? If the trim is on the front, I’m trying to visualize what the edges look like. Thanks!! I’ve been running around all day trying to get everything together to make this! I was wondering what type of plywood you used as in how thick was it!? Was it the thick heavy exterior one or the normal thin one? Thank you so much! Sorry just getting to this! It was exterior plywood and I have no idea how thick it is 🙁 Sorry! !